My mantra- Just pee and we will go back in the house. The longer it takes, the wetter you get. I completely understand what you're saying Heather. I too hate the rain and will do anything but pee in it. I'm a bit shy anyway when it comes to doing what needs to be done. The slightest noise or movement and I loose my concentration all together. Mom get's pretty upset because she knows the carpet is in danger if I don't do what I need to do outside. Do you have a covered area your mom can take you to for rainy days? Not only the rain, I don't even want to pee when it's wet on the ground. Mix my valuable pee with common ordinary water??? Otis agrees with you Heather! OMD!!! Our dad calls us STINKY ALL THE TIME too!!! How rude!! I dislike it to go out on rainy days, it's not easy for my staff to hold an umbrella over my head - but I hope they will learn it. A little off subject here, but has anyone checked Heather for a yeast skin infection? Noodledog has always been a stinky scottie girl, turns out she had a skin yeast infection. The treatment made her much less stinky and itchy. I was thinking the same thing. Well-cared for stinky pups usually equals a yeast infection somewhere -- skin, ears, etc. I'm all with you! Somedoggy left a puddle in the lounge room yesterday, it was raining. For the record, Travis won't go out in the rain, either. We live in Tampa, Florida and that proves to be a bit problematic due to our summer rains. 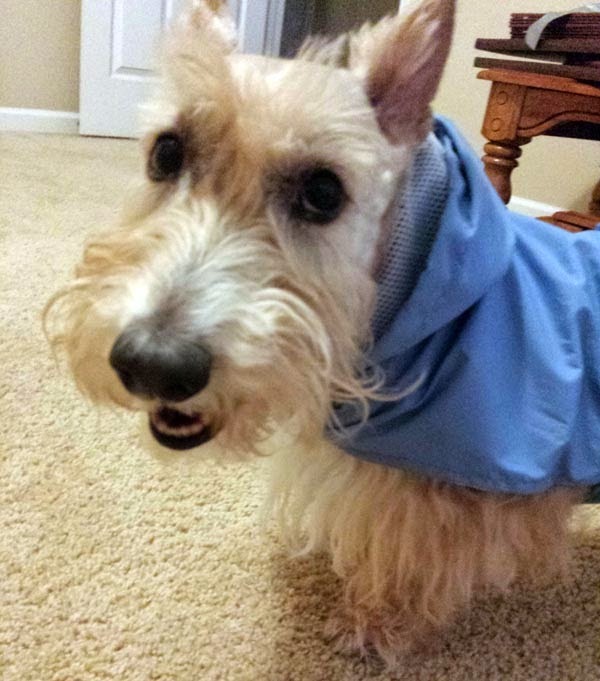 Mr. T won't go out if he even sniffs the air and determines in his Scottie brain that rain is on its way.